The Arizona Painting Company has awarded the winner of the First Annual Paint It Forward – Tucson $5,000 Giveaway project. 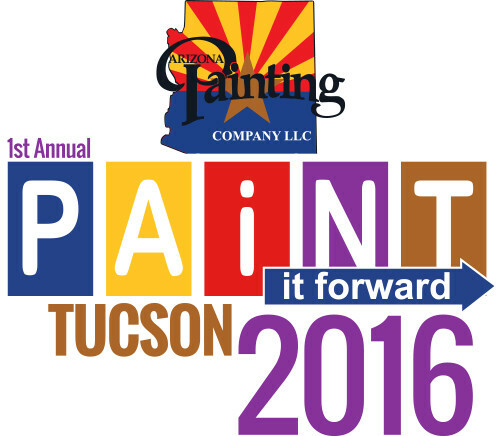 The Arizona Painting Company believes in supporting and giving back to our communities. While we have always given back by making donations to local charities and non-profits, this is the first year that we have extended this help to better the Tucson community. In August 2015, The Arizona Painting Company announced the Paint It Forward $5,000 Giveaway, the recipient of which receives $5,000 in free painting services and the best paint warranty in Arizona. Since Arizona Painting Company has opened a new location in the Tucson area, we received many stories of those who are deserving and in need of a fresh paint face-lift, but due to financial difficulties could not afford it. After very careful consideration the company selected Dillon and Jessica Belknap and their 2 young kids as the winners. All of The Arizona Painting Company employees, and even some of their family members, will be volunteering their time to the family in need on May 21, 2016 beginning at 8am until the project is completed. The best part is - we are inviting you to join us. Both Dillon and his wife, Jessica have an equally rewarding, but difficult job of raising a 6 month old and a 4-year-old. Supporting a young family on one income is no easy task, but, Dillon and Jessica have been able to do it and have taken the big step to purchase a home in Tucson for their family. Unfortunately, on their limited budget they haven't been able to afford any upgrades to the home, including its need of painting. All of their extra money goes to baby food and groceries and they cannot afford to repaint the interior or exterior of their home. That’s where Arizona Painting Company comes in! It was a very difficult decision to choose a winner among all the deserving nominees. We want to thank everyone who participated in this giveaway for supporting the cause, and helping us give back to the community that has already given us so much. To find out if your home needs a fresh paint job, use our paint evaluation tool at http://arizonapaintingcompany.com/paint-evaluation-tool/.